Protecting your restaurant against worker’s comp claims was a good investment. Not only does it give your employees assurance that they’re protected in case of an accident, but it also gives you peace of mind about the sustainability of your business should something unfortunate occur.Considering profitability is a top concern for any restaurant owner, we thought it would be helpful to provide you with some tips for minimizing your worker’s comp premiums. Let’s break it down. Coverage of medical costs for injuries on the job or job-related illnesses. Payment to the injured for lost wages during recovery times. Reimbursement of court costs and legal expenses. Conceptually, then, it makes sense that to minimize your premiums, you will need to demonstrate that you have taken precautions to deter accidents and illnesses from occurring in your restaurant. Lower risk, lower premiums. Because these factors are multiplied together, small reductions in your restaurant’s risk levels can translate into big savings. On with the tips! Put comprehensive employee safety training in place that not only alerts employees of the risks they face, but of the risks of the entire operation. Cooks and chefs aren’t the only ones who need to be aware of how to handle sharp/heavy kitchenware. Likewise, chefs have feet too and they’re probably even more likely to slip on a wet spot outside the kitchen since they had little way of knowing it was there. You couldn’t get away with giving customers food poisoning due to lax food quality and handling. This much is obvious for any restaurant owner! So it’s also extremely important that you keep safety in food handling in the back kitchen a top priority. A lot goes into meal preparation. Raw meat and produce + many hands + a tendency for people to cut corners when things get busy = a terrible recipe for foodborne related illnesses. Keep hazards top of mind for your employees and emphasize that a busy night is no excuse to neglect best practices for safety. Even though it is tempting to be cost-effective by minimizing food shrinkage, it’s best to err on the side of caution when it comes to expiring or spoiled food. Instead of cutting that corner, invest in quality containers and storage facilities, and be sure that they are clean and germ-free. A well-designed return-to-work program not only helps retain valuable workers, but it also reduces the cost of worker’s compensation claims (thereby reducing the cost of your premiums). Even if employees only return on a part-time basis at first, injured employees will collect fewer disability benefits than if they were forced to remain at home without a program in place. There are many helpful resources for designing such a program available to restaurants, such as the Department of Labor offering a Return to Work Tool-Kit. Be certain to ensure that any return-to-work program you implement complies with the Americans with Disabilities Act (ADA) and OSHA standards. 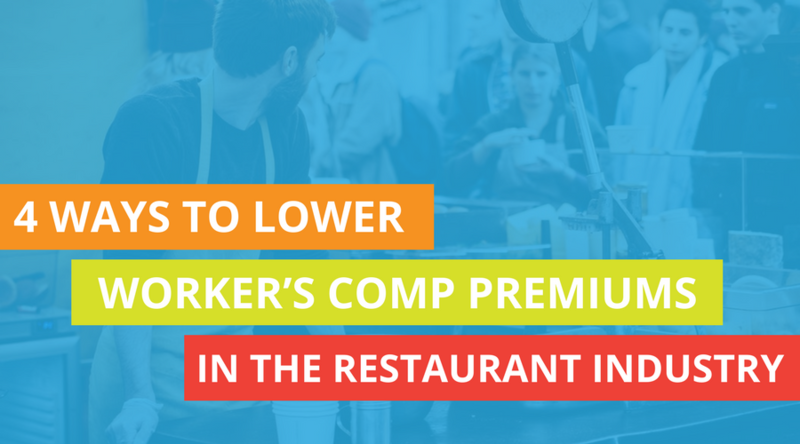 There are some state-sponsored programs that improve safety in your restaurant and, in return, reduce worker’s compensation premiums. For instance, many states give premium reductions for having a drug-free workplace. Additionally, some states offer discounts to recognized groups in the form of a group rating. In order to qualify for most groups, your restaurant will have to have an established, good safety history. If you can’t qualify now, you can always implement the other tips and make it a goal to become part of a group in the future. Not sure if your state sponsors any programs or group discounts, or have any questions about worker’s compensation insurance/minimizing premiums in general? Don’t hesitate to reach out. We’d love to talk over your situation and help you find the answers you need.